I was inspired to make my documentary Imagining a Better World in 2006 when I first read Dr. Nelly Toll’s award winning biography Behind the Secret Window: her remarkable story of hiding from the Nazis in occupied Poland alongside her mother during WWII. 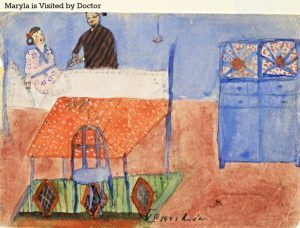 Still a child during this terrible ordeal, with her mother’s love as her only protection, Nelly created a body of sixty watercolor paintings depicting what her life would resemble under normal circumstances. Without the kindness of a Catholic family, who risked their lives simply by hiding them, Nelly and her mom would not have survived. Today, a renowned art therapist and teacher, she believes strongly in emphasizing the positive values she took away from her experience to triumph over adversity as she goes and visits schools, of all levels, across the country to share her story. The Nelly Toll Story is another example of “one man can make a difference”, a theme explored in my previous work, Sugihara: Conspiracy of Kindness. This documentary film relates the story of Japanese Diplomat Chiune Sempo Sugihara who risked it “all” acting against government orders during WWII to save the lives of strangers, by writing visas for escaping Jews. He did so with the belief that somehow these strangers would find their way to safety. Were it not for his courageous actions, some 60,000 people would not be alive today. As a storyteller, I am constantly reminded that FAITH is a critical tool in my work as well. Without it, no matter the value of our vision, it will not bear fruit. If courageous individuals, like Dr. Nelly Toll and Chiune Sugihara could “imagine a better world” under some of the worst circumstances in our history, well, so can we. As a filmmaker and a messenger, my subjects teach me through their stories, to have faith in a better humanity. diane estelle Vicari, Director / Producer is an award-­winning filmmaker and is internationally renowned for her work in promoting the production and advancement of the documentary film genre. Now in production on Imagining a Better World, her last documentary, Sugihara: Conspiracy of Kindness, won the Hollywood Film Festival Award for Best Documentary and the prestigious IDA/ Pare Lorentz Award. It has also been honored by the United Nations and aired nationally on PBS. This entry was posted in Uncategorized and tagged documentary, Faith, Imagining a Better World, Nelly Toll by Richard Kaufman. Bookmark the permalink.